iCraft Super Tape - THERM O WEB-Double-Sided Super Tape. The strongest acid free bond available! Adheres beads, glitter and more to anything. Clear adhesive with red liner. 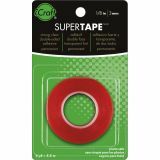 Super tape is permanent and extremely strong, know where you are going to place items before adhering them. This package contains 6yd/6.5m of 1/8in tape. Do not wash, do not sew, do not iron. Made in USA.